After a long flight from Singapore, we landed in London, and as we taxied I did my usual thing of checking out the exotic airlines you can see at airports outside Australia. 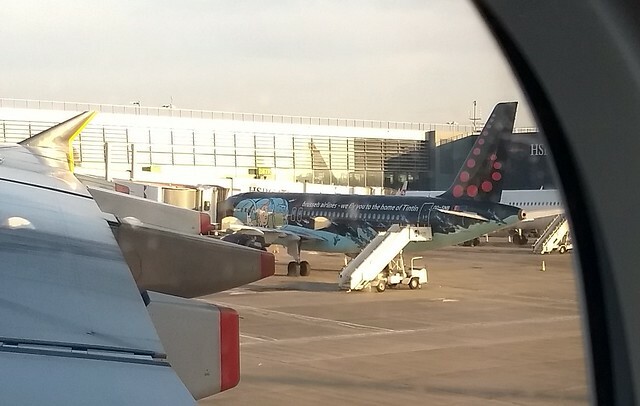 I particularly liked the Brussels Airlines slogan “We fly you to the home of Tintin” – apparently this is their “Rackham” aircraft. During the lengthy walk from the terminal we found the airport WiFi and connected for a quick update from home. We would find WiFi was pretty common around the UK and Europe, at many small and large institutions, including airports, pubs, restaurants. We cleared immigration via a chatty bloke from UK Border Force who wondered, since we were initially headed to Cardiff, if we’d be watching the test match. Cricket, I assumed? No, rugby! Then through customs – notably on this occasion, the “Nothing To Declare” and “EU” entries funnelled into the same corridor. Presumably as with the EU queues at immigration, some changes are coming to this. I found a mobile phone stand and bought a local SIM. It wasn’t quite as cheap as I hoped, but for £35 (basically £15 of fees for the SIM, plus £20 for the top-up), I got a Vodafone SIM with 4 Gb of data that would roam to Belgium with voice and data. They also sold the Three one I’d looked at with more data for the same price, but it didn’t do voice/text outside the UK… normally I wouldn’t be concerned, but it would prove to be useful in Brussels. The bloke at the stand fitted it into my phone and set it up for me. Good service. He said some people walk past and don’t even notice the stand is there. I’d recommend it. It’s in the subway on the way to the Heathrow rail station, near the entrance to the Underground. Which way from the airport? To coin a phrase from Doctor Who, he who wants to get from Heathrow Airport to central London by train has three choices: above, between, below. Below (cheap) is London Underground, though most of the route is not in fact underground. This costs £5.50 in peak, and is very frequent, but is also the slowest unless your final destination is along the Piccadilly Line. Which ours wasn’t. Above (expensive) is Heathrow Express. 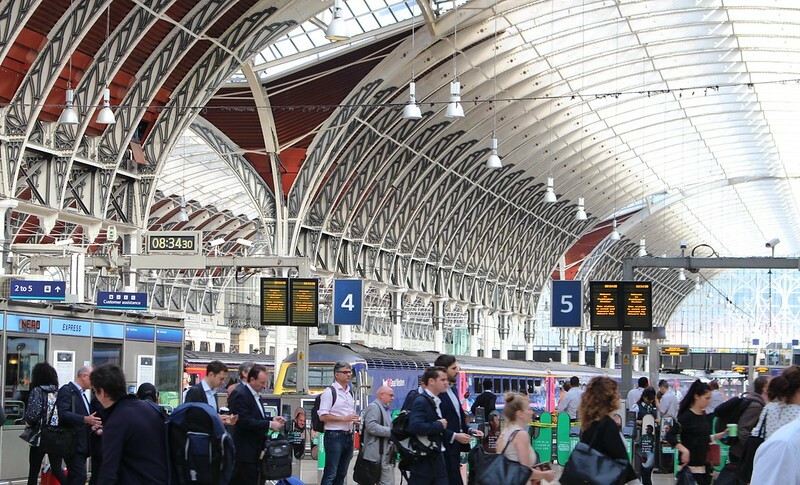 Frequent, every 15 minutes, and takes just 15 minutes to Paddington Station – which is where we needed to go. But over-the-top in cost, at £22 for a single trip, per person, though there are discounts if you book many weeks in advance. 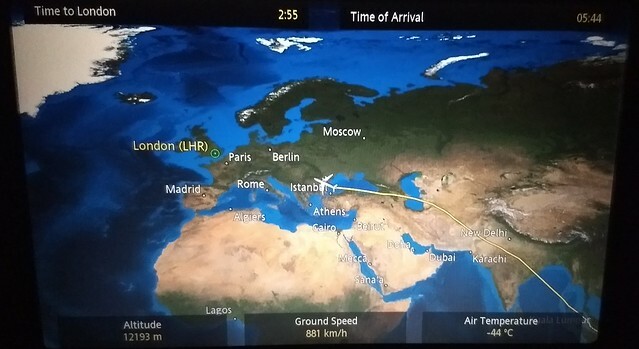 Between: Heathrow Connect. It takes much the same route as Heathrow Express, but stops at more stations, taking 27 minutes. It runs only half-hourly, so you might have to wait around for it. But at £10.30 per person (which is still a premium fare, by the way; non-airport trips on the same line are much cheaper), it’s a more affordable price if travelling in a group, so that’s what we took. We bought tickets and were on the 7:27 departure, and being rush hour the train got pretty packed by Paddington a bit before 8am. In comparison, the Heathrow Express trains we saw appeared relatively empty. I guess you’re paying a bunch more money for shorter average waiting times, a slightly shorter trip, and a less crowded train. Their own web site says they carry 17,000 passengers per day, and there are 150 services per day. So an average of 113 passengers per train? As with other premium-priced trains, that’s not a huge number of people. You could carry 113 in a double-articulated bus. I wonder if Heathrow Express is profitable? (Toronto’s much newer airport express is in deep trouble.) You wonder if it’d be better to combine the two services and run very frequent trains at a lower price. We arrived at Paddington and joined the back of the queue to exit the platform. The fare gates took a couple of goes to accept the tickets (but it may have been jetlagged-user-error), but we got through and found some food on the concourse. A quick look for the Paddington Bear statue was fruitless, but we found it on a later occasion. 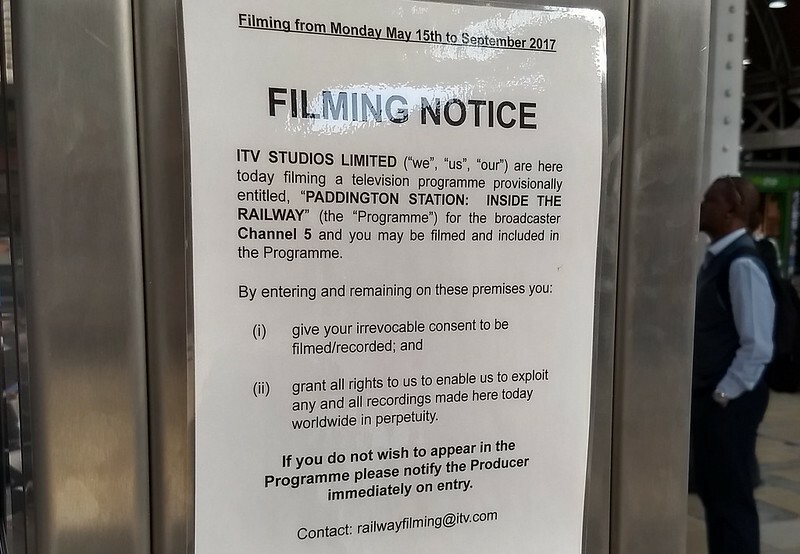 There was time to admire the architecture, and to note that a film crew was around somewhere, filming yet another one of those documentaries showing railway operations that the Brits love making (and which I find surprisingly addictive). The train left on time for Swansea (via Cardiff). It’s not “high speed rail” by Japanese or European standards, but the train zoomed along very fast. There was a noticeable rush of wind and noise as we passed trains in the opposite direction. 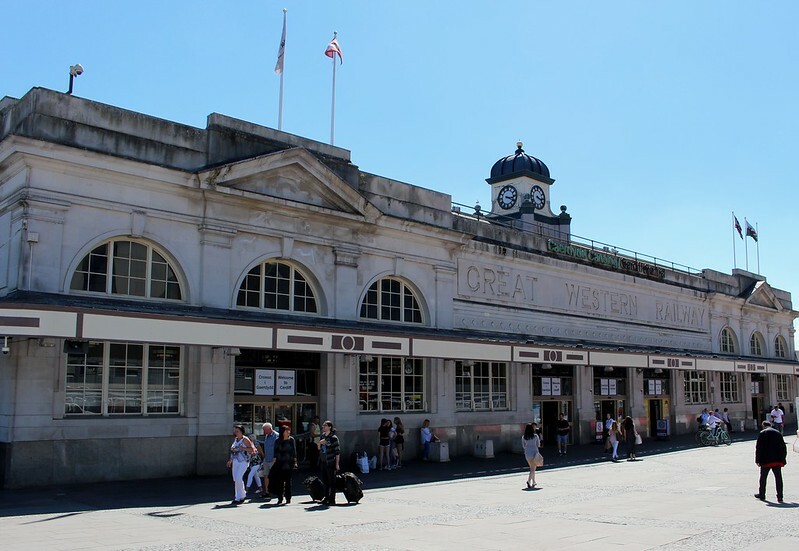 If you’re wondering, the schedule is: 8:45 London Paddington, 9:11 Reading, 9:39 Swindon, 10:04 Bristol Parkway, 10:31 Newport, 10:46 Cardiff Central. This is partly Brunel’s Great Western Main Line, built in the late-1830s, and partly the South Wales Main Line, completed in 1903. 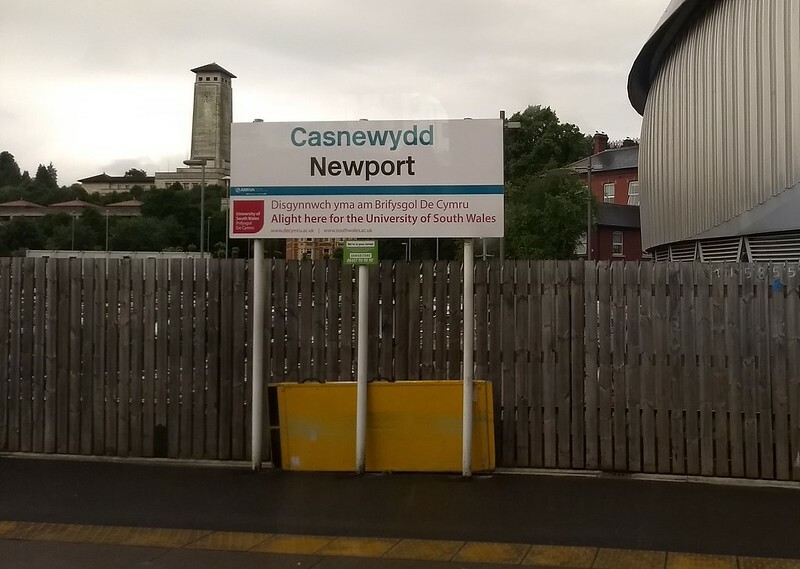 To Cardiff is about 234 km, which the train does in just on two hours, so a pretty good average speed of 117 km/h, though apparently the top speed is 200 km/h aka 125 miles per hour – reflecting the High Speed “Intercity 125” trains used on the line. These are a relative of Australia’s aging XPT, but clearly the trains and track are maintained to a far higher standard. The train wasn’t particularly crowded, and the seats in Standard (Economy) class were big and comfy, with free WiFi. There are lengthy (7 km) tunnels under the Severn river along the way – it’s all very impressive. And before you know it, you’re in Wales, which of course is a separate country to England. 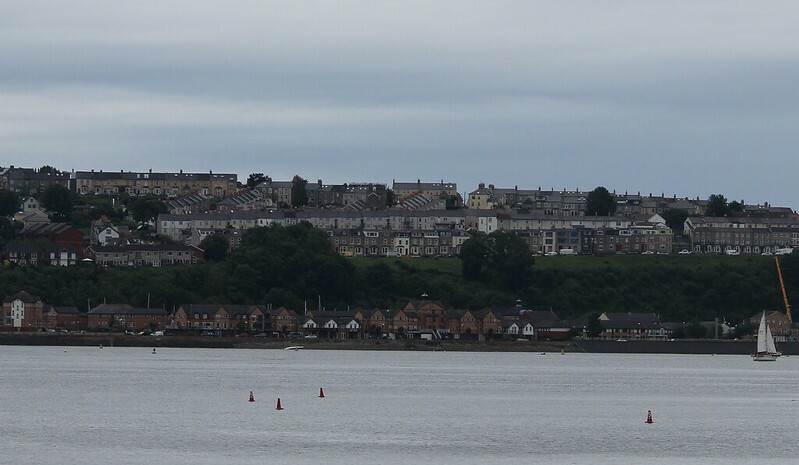 After entering Wales, we got to Cardiff pretty much on-time, and walked to our accommodation, an Air B’n’B place midway between Cardiff Bay and the city centre. For the trip, we’d booked Air B’n’B for the longer stays, with the aim of being able to make meals etc (which didn’t really end up happening apart from breakfasts) and hotels for the shorter stays. Getting there involves a myriad of major roads, side streets and canals in that area, which is precisely why I’d wanted a fully-functioning phone: during the trip, Google Maps would prove its worth time and time again. For navigating a new city, an accurate map with a GPS locator to tell you exactly where you are is invaluable. Okay, so sometimes it couldn’t tell you which direction you were facing. But walk a few steps and see which way the dot moved and you were set. 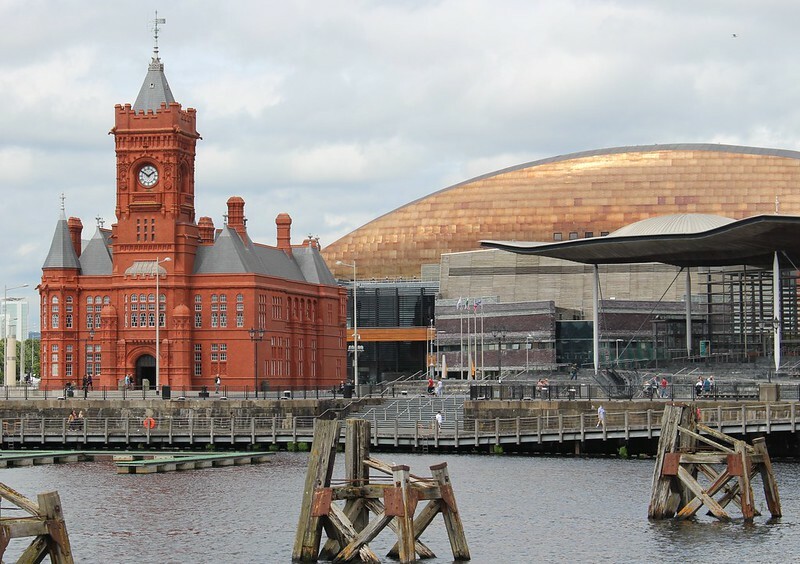 We dropped off our bags (as per agreement with our host, we were a little early to actually settle in just yet), and walked down towards Cardiff Bay. Some friendly neighbours directed us to the scenic route, via the old canals. 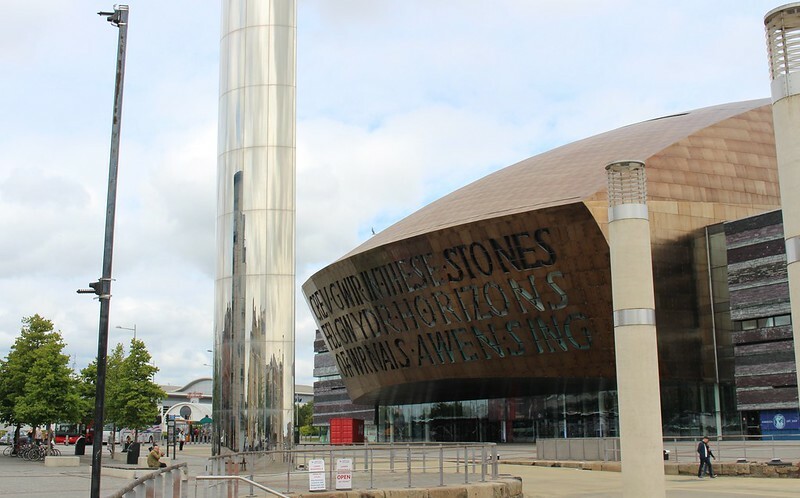 The Wales Millennium Centre is an incredible landmark, so we stopped there for some photos, and explored the surrounds. 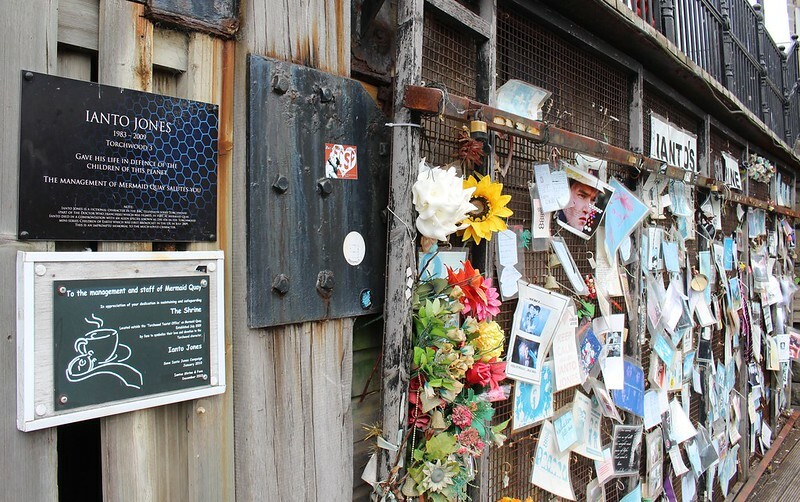 Fans of Doctor Who and its spinoff Torchwood would recognise the area, and there’s a shrine to Torchwood character Ianto on the pier. Lunch on the waterfront lunch at a burger bar, then we walked back to have a post-trip shower and a rest. Time to explore! 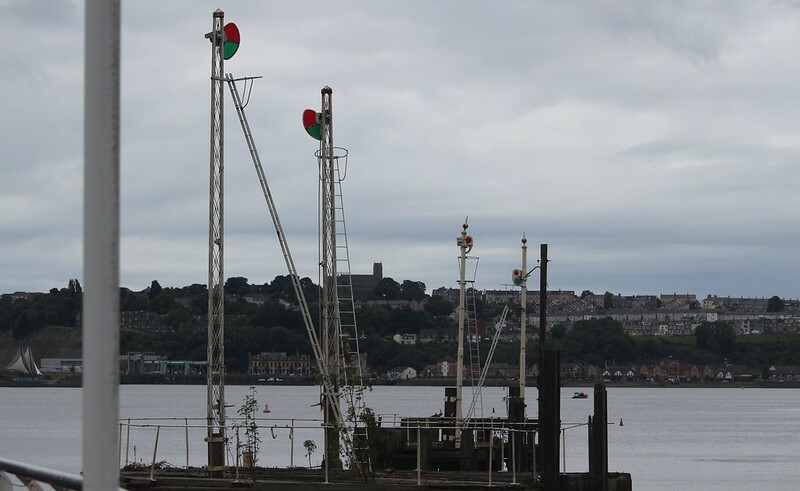 This time we headed into Cardiff CBD, to help get our bearings. Finding a supermarket, and given we were all tired, we ended up with a plan to get some salad and a cooked chicken and take them back to the flat to eat. But do Welsh supermarkets sell cooked chooks? One didn’t. One did, but they’d sold out. Eventually we bought salad (and other supplies) at a supermarket and a chicken at Nandos. We trekked back to the house with it. Dinner solved. Jetlag was starting to kick-in, so after a little TV, it was bedtime by 8pm. 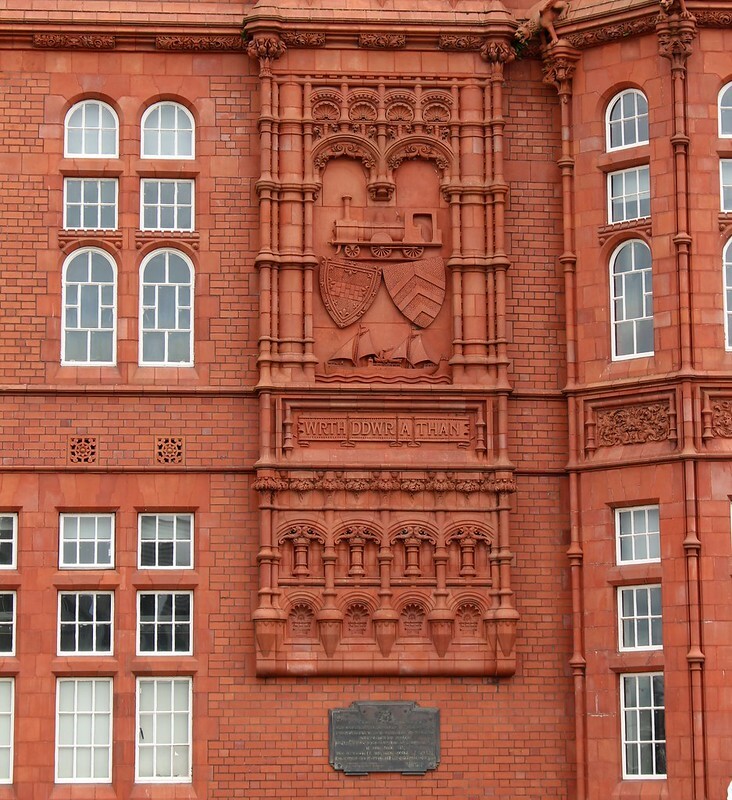 Why Cardiff? Some of you may have guessed, but if not, stay tuned. My understanding with Heathrow Express is, it has first class and second class carriages, and that Heathrow Connect is the same price as second class on Heathrow Express??? Was that still the case when you where there? @Jim, yes Heathrow Express has Standard and First Class pricing and seating. 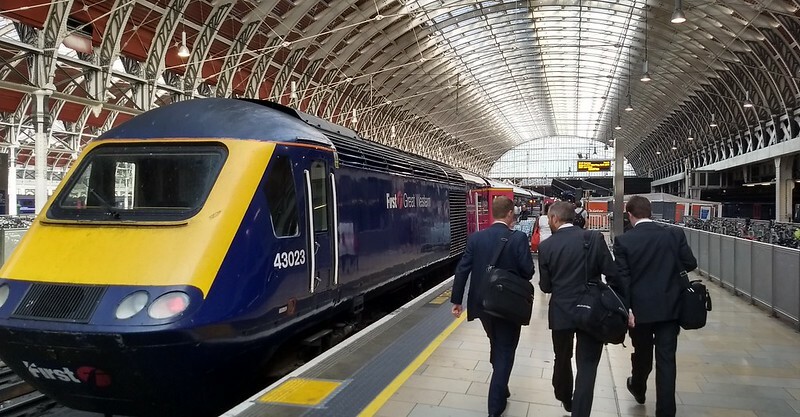 As I note in the post (perhaps not clearly enough), Heathrow Connect is about half the price of Heathrow Express Standard (second) Class. HC is £10.30, HX is £22-27 for Standard (depending on whether pre-booked, and if peak or off-peak), or £32 for Business/First class. That said, if you’re organised enough to book HX 90+ days in advance, the price is as low as £12.10 on weekdays, £5.50 on weekends. I wish I’d been that organised.